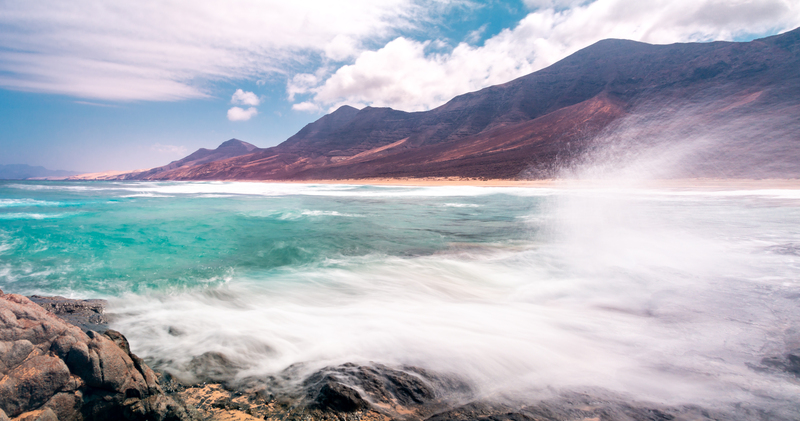 A wild day at Playa de Cofete on the Canary island of Fuerteventura as waves crash and thick layers of clouds form around the surrounding mountains. The stunning panorama of Fuerteventura as seen from the Mirador Morro Velosa – six vertical frames each at 70mm taken and stitched together in post to create this kilometer long view across several barranco’s. It’s actually not that long ago, that I owned a computer with a hard drive of the size of the original file of this image. It brought the old laptop I had with me on the trip to Fuerteventura down to its knees processing it. On top of the world…. or at least Fuerteventura. A few steps more and from there it’s pretty much 807 meters straight down! It was the rewarding end of a 30 kilometer hike starting at sea level in Morro Jable under the grueling midday heat. From there it went along the beautiful Jandia beach all the way up to the summit of the highest mountain of Fuerteventura – the Pico de la Zarza, offering the most stunning panoramic view over the beach of Cofete.